I have a White 2037 sewing machine and just got a darning foot for it so I could attempt to quilt the many tops I have completed. The problem is the quilts are queen to king size and I'm having trouble fitting it in my machine to stipple or free motion quilt. The tension is not correct. I have been doing more ripping out then sewing. I am very novice to free motion quilting but have practiced on smaller sandwiches with great results. Why then when I attempt to quilt my actual size quilt it gets messed up? First of all, CONGRATULATIONS!!! You're on your way! Now let's see if we can solve some of your problems so that you can start enjoying the experience. Have you used a practice quilt sandwich made from the same materials as you've used in the quilt? Needles, threads, batting and fabrics ALL have an effect on the tension. The speed at which you quilt (the combination of how fast you move the sandwich and machine speed), I believe, also effects tension. If you're having problems with 'eyelashing' or 'railroad tracks', click any of the links below for information on how to avoid or combat the problem. Tension problems, I've tried EVERYTHING! From your question, I can see that you 'get' this. Work on your smaller quilts first. There definitely is a learning curve on working with larger quilts. The good thing is that if you have a number of them to quilt, you'll get the repeated practice much faster than if you only had one quilt sitting. 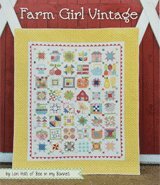 You WILL see improvement in your quilting stitches as you move through your backlog. Have you done some ditch quilting to stabilize the areas or blocks of your quilt? I can't stress enough just how important this is. It allows you to remove pins close to the stitching. You won't have so many pins in your way obligating you to stop and remove them during quilting. Any problems with puckering or tucks or 'poofing' of the quilt are contained in the area surrounded by this straight line quilting, whether it be an area (like the diagonal corners around a medallion center) or a single block. 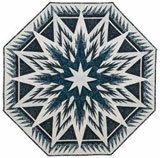 Once it is ditch quilted, you can start your quilting in any block in the quilt. You needn't start in the center and work your way out. This helps in that you can warm-up on the outer blocks and as your work improves, move to the center where a viewer eyes are going to go first. Professional quilters use this technique all the time—they've got to warm-up, too. What if the quilt isn't suitable for ditch quilting? I've stabilized quilts that will be quilted with all diagonal quilting stitches, by stitching long lines through the center, both vertically and horizontally, with water soluble thread and a longer stitch. Totally ignoring any of the 'ditches' because this stitching is only temporary. Imagine a quilt that is a straight set of 3 blocks in a row and four rows. Then imagine it is ditch quilted in the seams joining those blocks. You have what amounts to 12 little 'quilt-lets' all joined together. However, the quilting in one doesn't effect the quilting in it's neighbor. Then the only thing to worry about moving is the area of the quilt-let between your hands (or in a Quilt Halo if you're using a quilting aide). The problem then becomes what to do with all that quilt that's under the arm of your sewing machine. Personally, I 'smush' it under there instead of rolling it. I find that rolling it creates a stiff 'log' of a thing that's hard to manuever. It does take practice to get used to dealing with all that excess. That coupled with the firm understanding that the ONLY thing you're moving is what's between your hands will help you grow into the process. There's no 'secret sauce' for this one. When you first start out, it IS SERIOUSLY annoying. That's the truth. But you do get used to it as long as you keep going. If you can get the tension issue under control—as long as your machine is in good working order, that amounts to adjust and test, adjust and test, until you've got it—you have the perfect opportunity to learn to free motion quilt your quilts. 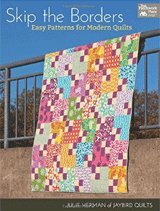 Simply because you can repeat the process several times in a row, instead of quilting one and then waiting at least several months until the next one is ready. From personal experience, I can guarantee that you will improve with more quilting under your belt. The quilt above was my first major free motion quilting experience. I really went to town on it in a blue metallic thread that matches the background color almost exactly. 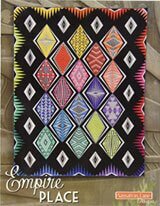 I remember how very proud I was when someone at our Guild's quilt show, when talking with her friend, said that it was prequilted fabric. I remember the feeling of accomplishment! Now, however, I really cringe when I look at the quilting. Uneven stitches, wiggling lines, crossovers. But that's what learning is all about. And as long as you don't quit, you WILL succeed. You know to start small. You know to practice. You ask questions when you're stuck. You are mindful of tension issues. 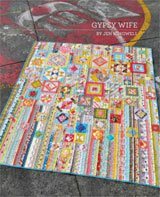 Readers, please do share your advice for this Novice Quilter, we were all there in the beginning, too! Thank you so much for your tips on stippling. They were tremendously helpful. It gave me a little more confidence to try my first attempt at this. 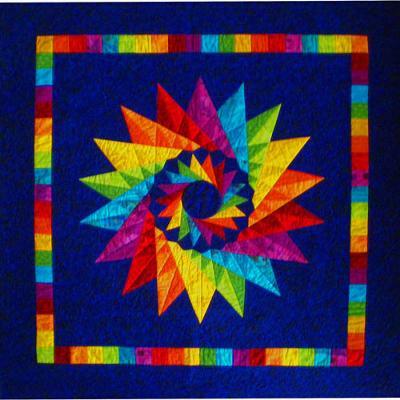 I love the picture of the first quilt you tried, the bright colors can you tell me what the name of that pattern is. Update: I completed my first stippling quilt. The King Size (my first) is done and I love it. However my White 2037 ended up breaking down. The tension component inside got bent etc. Quilting was too much for it. I so do love this blog. Everyone is so helpful. I am now onto my other quilts to finish. I'm right there with you as I am also a beginner. I have found this site so helpful and just full of good advise. Good luck to the Novice Quilter. I am so thankful I found you for help and encouragement. Tears came to my eyes while reading encouragement that I can do it and your tips were outstanding. I did exactly what you said and went through your checklist of things to do with my machine etc. It was very challenging at first but how wonderful it is to finally be on my way to completing my quilt tops. So far no more rip outs. Update: I have almost completed my quilt #1 with my own free motion quilting. WOW! Everything you wrote me WORKS like a charm. I am SO THANKFUL and can't wait to have my final result soon! I am doing it finally.